We have lots of different sized and style of teddy bears here at Calendar Lady Promotions and this includes our Scraggy Bear with Advertising T-Shirt. 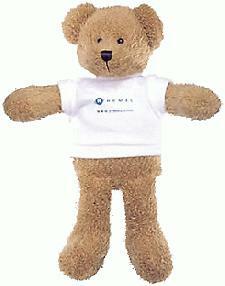 He stands 9 inches tall and will display your message or company details and logo upon his little cute T-shirt. So help to promote your business details upon our Scraggy Bear with Advertising T-Shirt today! To find out more about our Scraggy Bear with Advertising T-Shirt click here and fill in the contact form and we'll get straight back to you. Other promotional and personalised items besides our Scraggy Bear with Advertising T-Shirt click here.